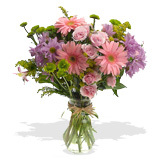 $35 - $50 Flower Centerpieces If you are not sure what sort of fresh flower centerpiece would compliment your home décor or event, let us help you decide. We have highly skilled in-house designers who know how to decorate for every occasion. For yours, or for that someone's special birthday, choose a special birthday flower centerpiece, we have them specially designed with birthday celebrations. No matter what the occasion we have expertly designed flower centerpieces. Every event is important to us, whether you need a birthday flower centerpiece or a baby shower flower centerpiece, we have it all.